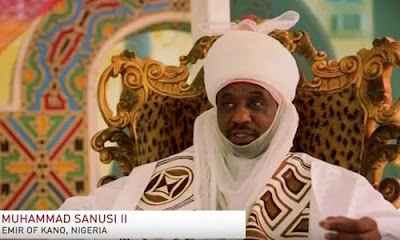 The Emir of Kano, Alhaji Muhammadu Sanusi 11 has declared that the war against corruption launched by the present administration under President Muhammadu Buhari can never be won unless there are appropriate sanctions for offenders and monitoring of corrupt cases by the forth estate of the realm- the media. Sanusi specifically highlighted lack of discipline, sanctions, monitoring and evaluation of corrupt cases as the four major problems aiding high level of corruption in Nigeria and other developing countries in Africa and Asia in general. The monarch who was represented by the Sarkin Shanun Kano, Alhaji Shehu Mohammed made these declarations on Wednesday while speaking at the opening of “International Conference on Tax Havens and the Developing World: The Global Dimension,” organised by Centre for General Studies in conjunction with office of International Programmes, University of Ibadan. Sanusi who regretted that it is unfortunate that most companies and individuals who are suppose to pay tax in developing countries in Africa and Asia hide under the guise of tax heaven to avoid tax payment, informed that most Nigerians quote laws to disobey the laws at the expense of socio-economic development of the country. He said “Most Nigerians do want to pay tax, most Nigerians uses laws to disobey the law. Most individuals and companies in Africa and Asia prefer to take their money to tax heaven to avoid payment of taxes. He however said that corruption is the biggest problem encouraging tax heaven to thrive as he remarked that most companies and individuals hide under the guise of tax heaven to avoid tax payment. “Corruption is the biggest problem that is encouraging tax heaven. The monarch then maintained that the war against corruption can be won just within six months if the government can instil discipline among the citizens and provide appropriate sanctions for the offenders. Sanusi, however, tasked journalists to do follow up to stories of corrupt cases after they have been reported in the media. He said journalists can do monitoring and evaluate of corrupt cases under the Economic and Financial Crimes Commission (EFCC) as ways of taming corruption. “There are four major problems that is aiding corruption in Nigeria. One is lack of discipline, the second one is lack of sanctions, the third is lack of monitoring and the forth is evaluation. “Lack of sanctions. I know the EFCC man that is here, they are working, they are fine policemen who are good in forensic analysis but if sanctions can be where they should be, I can tell you that six months we can fight corruption. “Lack of monitoring and evaluation of corrupt cases, the press are not monitoring corrupt cases. I wish the press can keep their diaries and remind the EFCC of all the corruption cases. There is no monitoring of the cases. “I want to suggest this to the conference and I believe this is what the conference will address”. The Vice Chancellor of the university, Professor Idowu Olayinka who spoke through Deputy Vice Chancellor (Administration) Professor Emilolorun Ayelari maintained that tax payment is a compulsory obligation which all citizens within the reach are expected to pay. Director General, West African Institute for Financial and Economic Management (WAIFEM), Lagos, Professor Akpan Ekpo in his keynote address titled, “Tax Havens: issues of international tax evasion and avoidance – A Global perspective”, identified lack of transparency and sharing of information as a major problem responsible for low tax revenue in the country. He, however, suggested establishment of public registries of verified ownership of all legal entities. Ekpo also called on policy makers to compel multinationals and companies to publicly declare their revenues, profits and losses as ways of ensuring that all and sundry key into payment of taxes.